A visit to Lapland will typically offer the chance for your family to catch a glimpse of some of the many animals which inhabit this remote region. Seeing these creatures in their natural habitat is a real delight for adults and children alike. Whilst reindeer are not strictly wild animals (they are herded) they roam freely in these parts and, whilst children may have perhaps seen them at local Christmas fairs or wildlife parks, here in Lapland they are in their true home and you will delight in seeing them trot across the snow with their head held high. Other highlights can include the likes of foxes and Ptarmigan along with other birds. In parts of Sweden, you also have the chance to search for elk in their woodland home. Norway offers the chance to see the giant of crabs - the king crab. You will travel to the harbour to pick up king crabs from the fishermen’s pots and return after a snowmobile safari around the Siberian forest to enjoy your king crab dinner - a speciality in these parts that has to be tried! For those who want to see it all then we highly recommend our holidays in Ranua where you can visit the famous wildlife park and witness the likes of wolves and gaze in awe at the polar bears which live here. A favourite animal encounter with our families is the chance to see the huskies that live and work in Lapland. They are neither wild animals nor pets, so a visit to a dog sled centre offers the chance for you to learn about the dogs and enjoy their company. Where can I go to experience wildlife? In almost all of our destinations, we feature reindeer or huskies so there are always plentiful opportunities to see these animals across our trips. For any family who would like to really get up close to a range of animals then we cannot recommend our Ranua trips enough. These feature the amazing Ranua Wildlife Park where families will be able to see over fifty species of animals including otters, snowy and great grey owls, wolves and lynx. The parks most famous inhabitants are its polar bears and during some holidays our families get to accompany the guides as they feed these exceptional animals. 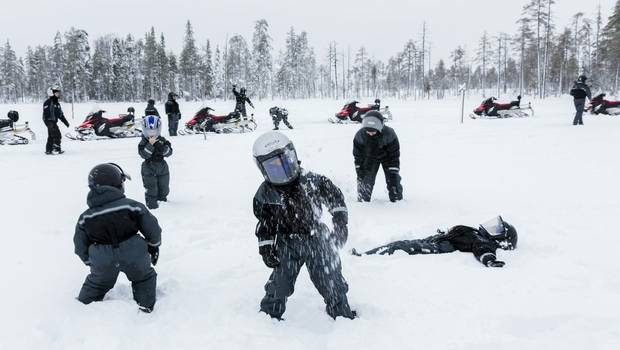 When looking for some of Lapland’s animals in their natural habitat, sightings, of course, can’t be guaranteed although our guides always know the best spots in which to seek them out. During any of these activities, the journey is very much part of the experience and your guides will highlight any of flora, fauna or animal tracks as you go; always an educational experience.